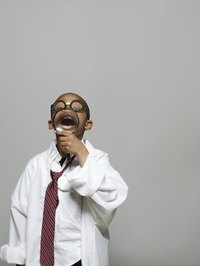 Any child can look like he’s got all the answers when wearing his own homemade lab coat. Create an easy lab coat from an oversized white T-shirt, a little fabric paint and a small piece of cotton fabric. This lab coat is useful for costume wear, birthday parties or theater needs. Lay a large white T-shirt onto a flat surface. Draw a line with the black fabric paint across one side of the T-shirt neckband. The line should be 2 inches right of center and drawn at a 45-degree angle. Make sure that the line extends 4 inches from the edge of the neckband. The end of the line should be pointed toward the sleeve portion of the shirt. Draw a straight line with the black fabric paint from the end of the 45-degree angle line that extends straight down to the hem of the T-shirt. Use a yardstick as a straightedge so your line will stay straight. This line gives the illusion of two pieces of fabric – one on top the other. Measure the faux button placement and mark the locations with fabric paint. Place two dots beneath the 45-degree angle line. The marks should be roughly 1 1/2 inches apart. Add more dots to the left of the straight line every 1 1/2 inches until you reach the bottom hem. The dots should be evenly spaced and in a straight line like they are stacked on top of each other with a slight space between. Paint large buttons over the dots with more black fabric paint. Let the painted buttons dry. Create a pocket. Use a piece of white cotton fabric, 4 inches by 8 1/2 inches big. Fold the white cotton fabric in half lengthwise – right sides together. Sew the fabric to itself along three sides. Trim the corners so they are rounded. Turn the fabric right side out. Smooth the fabric down and iron flat. Turn down the unfinished edge. Iron the edge and tack it in place with a few stitches. Pin the pocket to the left side of the shirt. Make sure that the turned-down edge is at the bottom of the pocket and between the pocket and T-shirt. Sew the sides and bottom of the pocket to the T-shirt. Instead of using faux buttons, hand stitch large black buttons to the front of the T-shirt. Add a red bow tie to the neckband area for a more formal scientist look. Paint a pocket onto the front of the T-shirt instead of sewing on a fabric pocket. Add a name tag or a badge to personalize the lab coat. You can paint a badge onto the coat with fabric paint or clip a handmade badge onto the pocket area. Don't forget accessories. If you don't have access to a real or play stethoscope, paint one around the shoulders of the lab coat, if desired.